I wish they change the lid. The product also accumulates at the mouth! The Nature's Co Passionfruit Body Lotion* contains nutrients and vitamins that hydrates and nourishes tired and dull looking skin! I wish The Nature's Co changes its body lotion packaging. It's not at all practical. The flip top is not very tight so I avoid carrying it with me while traveling for the fear of spillage or leakage. All the information is printed at the back of the bottle. 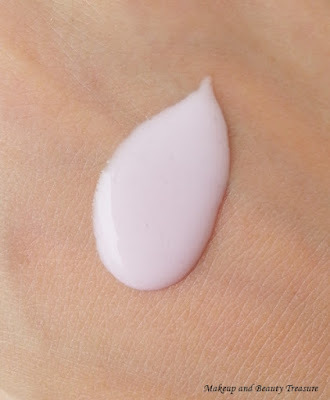 The body lotion is purple in color and looks exactly like my favorite blackcurrant ice cream. It smells very yummy and refreshing. I have not seen passion fruit so I am not sure how it actually smells. It has sweet scent that is mild and pleasant. The formula of the body lotion is just perfect. It is neither very thin nor very thick. It has the right consistency and applies easily on my skin. It gets absorbed quickly and does not feel heavy or greasy. The scent fades away after about half an hour. My skin feels soft, smooth and well hydrated after using it. I always make sure to use it post shower. It contains all good ingredients that keeps skin nourished and hydrated! - Comes in a sealed wrapper to ensure you get brand new product! - Moisturizing enough for the whole day! I have normal body skin. - Does not feel heavy or greasy. - Gets absorbed into the skin quickly. - Makes skin soft and hydrated. - Might not be very rich for extremely dry skin. - Not a travel friendly packaging. The Nature's Co Passionfruit Body Lotion is a mild and yummy scented body lotion that keeps skin soft and hydrated. It does not feel heavy and keeps good care of the dry areas like elbows, knees and heels really well. If you are looking for a light yet hydrating body lotion then I would happily recommend it you! - I love using it post shower when the skin is still damp! - Apply more quantity on the dry areas. Have you tried The Nature's Co Body Lotions? What is your favorite? Labels: Body Care, Body lotion, Product Reviews, Skin Care, The Nature's Co.
You can always buy online! Looks like a good one, except for pricce.